on bands 10 through 160. With the solar flux peaking on March 8 to 155 SFI, signals were loud on all the HF bands and open to all continents. I was able to concentrate my efforts on the 12 & 17 metre WARC bands during this period. As always, the equipment at your station worked flawlessly and it is terrific to have efficient antennas on all the HF bands. This was my 10th operation from VP9GE. We will be back soon. 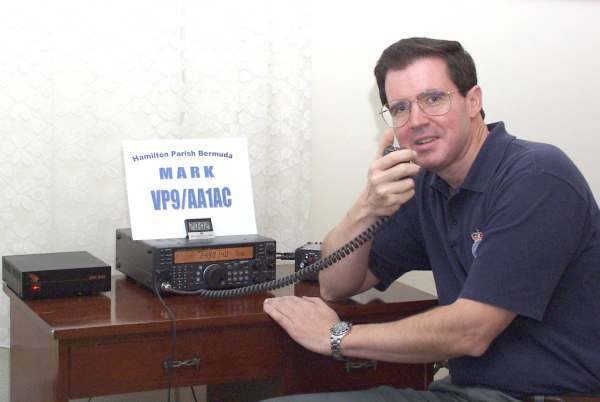 "Many thanks, as always, for your hospitality during my December 9-13, 2006 operation, as VP9/AA1AC, at your QTH. This was my seventh visit. I had great fun making almost 1,900 QSOs, operating on all bands from 10-160 metres. I was especially pleased to make over 150 contacts on Sunday in the 10 metre contest. The array of antennas at your QTH made it easy to operate all the HF frequencies. I was able to work into Europe right after sunrise with the tri-bander. There were many comments I saw on the cluster on the strength of the signal from your QTH. Ed, thanks for everything, and I look forward to coming back soon. Thanks for your note. I have had excellent luck with tuning the G5RV on 10 metres - all bands. The internal tuner I had at your house had no problem. As mentioned, I wasn't able to tune up on 30 or 17 metres with that antenna. I have found the antennas to be quirky in rain (not to mention ice or snow). I have received over 100 direct cards since I returned, including about 20 from Japan already. Many stateside guys are asking where I stayed and I am giving them your call. I will also refer them to your web site. Several Europeans remarked on the strength of the signal from your QTH. Since my QSOs were manually logged, I can only guess that I made 2,700 QSOs from your QTH. I would guess that half were made on 12 metres, and the rest split between 10 and 40. Have received several cards from the 200 QSOs made on 75/80. Next time, let's figure out how to get on 160. Saw some RTTY spots for you on 40 and 80. Another successful trip to your QTH as VP9/AA1AC. Despite poor HF propagation, and several days with no sunspots, I was able to make over 1,900 qso's during March 11-15. Unlike my trip in December, when I made a significant number of contacts on 10 through 20 metres, the low bands were much more productive this trip. The low bands were open as early as 3 pm Bda time and most of the contacts made during this visit were on 30 & 40 metres, with a couple of good runs on 80 & 160. As always, the gear worked flawlessly, internet access was enormously helpful and the low-band antennas never cease to amaze me with their effectiveness. I appreciate your help with all the details. All best wishes to you and your family. Hope to see you soon! Many thanks for all you did to make my December 6-12, 2009 operation from your qth as AA1AC/VP9 a successful one. Over the 5 days of operation, I was able to make 2,500 contacts very easily. This year, 20, 30 & 40 metres were the most productive. While this was my ninth visit to your home, it remains quite a thrill to operate on 10-160 metres with the first-rate equipment and your array of antennas.